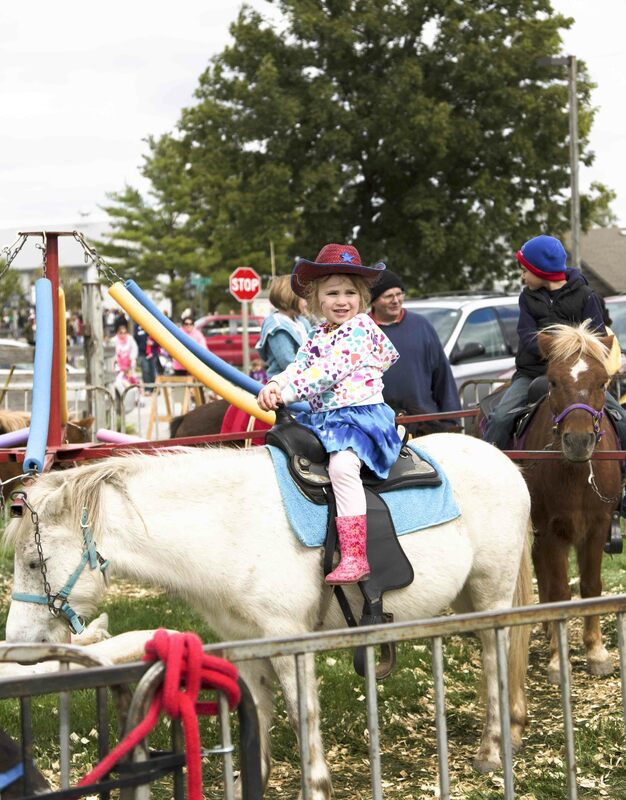 Come join us for our annual Wurst Festival in Amana! The German tradition of making sausages is alive and well in the Colonies and we want to share some of the best with you. 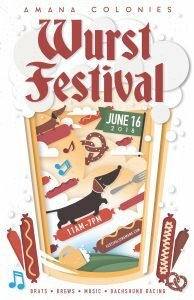 Wurst Festival was Voted Best New Festival in Iowa, you don’t want to miss it out on this celebration of everything sausage, as we have wurst makers come from near and far! 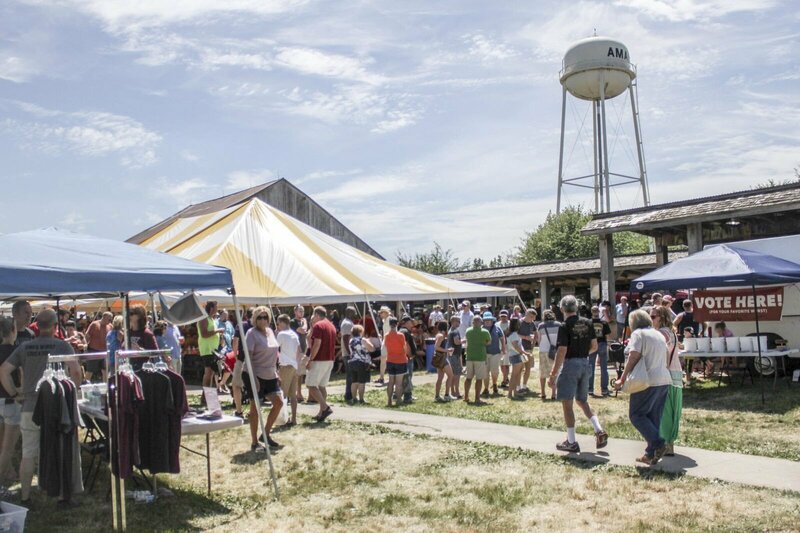 At the market barn area, in the center of the village of Amana, you will find a host of sausage vendors from Iowa and surrounding states. 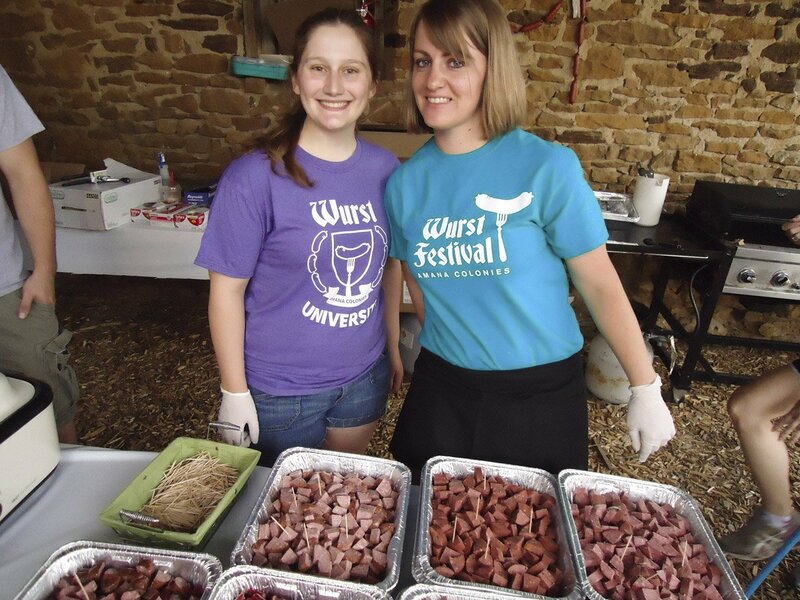 Wurst Festival features different types of brats, sausage creations, and more things meat! Try from all the booths and make your pick! Not only will there be classic brats, there will also be some creative and innovative twists on the beloved brats that will make your mouth water. During the day, the sausage makers compete for a few coveted awards. Judges will select the winners for the Best in Wurst, Creative, etc, while YOU will select the people’s choice winner, so make sure and try as many as you can before you cast your vote. Man cannot live on sausage alone so take a break from the summer heat under our beverage tent. We will have Millstream beer, some Amana wine, and other beverages for everyone. Music will be playing throughout by some great local bands! 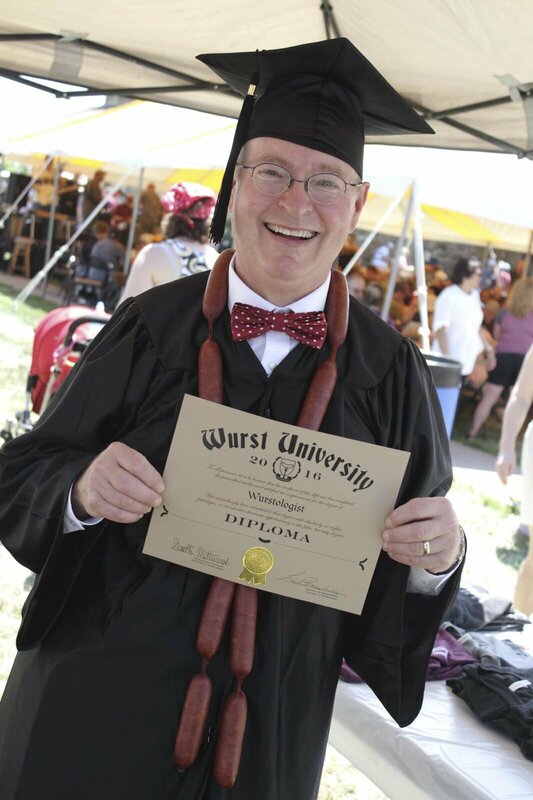 For only $20 you can get enrolled into the University and you receive your diploma, a Wurst University t-shirt, and 4 sausage vouchers to sample your way to graduation! This will be a fun way to taste all our sausage vendor’s creations, and be on the fast track to your sausage degree. We promise Iowa’s WURST education! While you are with us during Wurst Festival, we will have fun and competitive games that you can be a part of. Take a minute to check below for more information on the games, and schedule for all the events you can participate in throughout the day! Game registration will happen the day of the festival, so make sure you come on out and join the fun! 1 PM Masskrugstemmen “Beer Stein Holding”: A tradition in Amana that you don’t want to skip out on. This will be held at the Market Barn, men’s & women’s divisions. Register that day at the game registration table, so come early to secure your spot! $40 entry fee gets you an official stein holding t-shirt, a 2019 Oktoberfest mug filled with Millstream Wheat Beer. For questions, call 319-622-3216. Come find out if it’s the muscles or willpower that wins this year’s contest. 2 PM Hang Dog Competition: A fun game for a team to participate in together! Find yourself a buddy; one will guide the hanging sausage for the other partner to eat. No cheating, keep your hands behind your back while you try to be the first to finish the sausage. 3 PM Two-On-A-Tube: A contest where partners Lady and the Tramp style their sausages to the middle! Hands behind your back, and the first team to the center wins! 4:30 PM Dachshund Derby: The contest you have all been waiting for! Our 4 legged furry friends get to participate in a competition as well. Our little sausage shaped buddies race in the derby style competition, to see who will be in the final heat to win Grand Champion. The race is open to the first 50 Dachshunds to sign up. Fill it out and turn it into events@amanacolonies.com or register the day of. Registration fee is $5. Proceeds of the Dachshund Derby go to Dogs Forever, a shelter for dogs until they can find their forever home. Grab a beer and a brat, then participate or cheer on your friends in the games; we guarantee you’ll have the Wurst Time Ever! Around town at the local businesses, there will also be activities, and things you will want to make sure that you see. Check out our online brochure to see what else is happening in the villages! 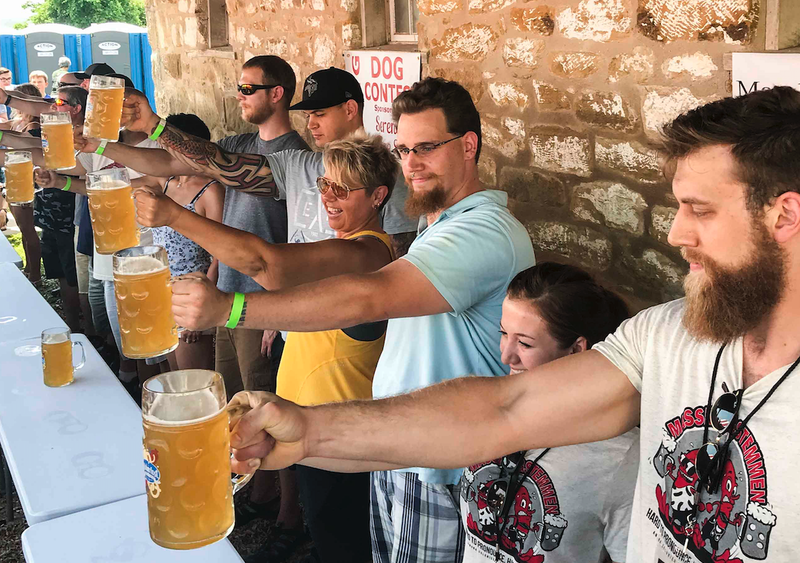 Many people come out every year to the Amana’s for the Wurst Festival, so make it a new tradition with your friends and family, filled with sausage, beer, music & fun! Dachshund races at the Amana Wurst Fest!